The patch media cabinet is at the heart of the network. 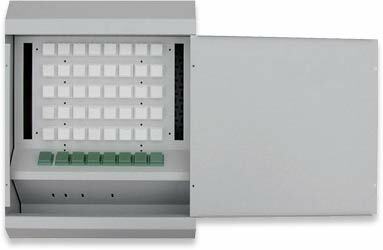 Robustly made and finished in light grey enamel, the unit provides up to 5 eight-port rows for locating the cable terminations and the hardware interfaces. The media cabinet comes in two models - Patch8 and Patch32. The Patch8 is an 8 faceplate enclosure. The Patch32 is a 12 to 24 faceplate enclosure. The TV distribution kit, telephone distribution kit and LAN distribution kit are pre-installed inside the Cabinet. Both styles of patch media cabinet provide additional ports and room for more hardware should you decide to expand your system. The patch media cabinet is the central distribution point of all the multi-media signals. Incoming signals, whether they are from aerials, telephone sockets or any other devices situated throughout the house, are routed to the patch media cabinet. Here, using leads, they are cross-connected and re-routed to where you are relaxing or working and want to listen, talk, see or play. Together with the other two key assets of the system, namely, the Cat 8 cable and the faceplates, they all work in harmony and provide an almost limitless ability to connect any device or service to your network. At a central location you will have all the main incoming services that are normally provided to a home, such as master BT telephone socket, TV aerial, etc. These central services can be routed to any room, often to multiple rooms. Any device can be connected to any room either as a source or as a destination. It does this by means of very high specification patch cables. There is no software to go wrong. There is no complicated configuration process. It's simply down to the capability of the cable itself and how you have organised access into the rooms of your home. For example, a CD player may be in your living room. To feed the output of your CD player to the kitchen, simply connect the phono leads provided to the room adaptor lead in the living room. This connects to the faceplate and feeds the signal back to the media patch cabinet. From the media patch cabinet you can, for example, route the signal to the kitchen or any other room and, using a lead, plug it into the AUX input of a Hi-Fi system at the destination. It is elegant, simple and user-friendly.